Congo gorilla Safaris has tailored the great memorable republic of congo for gorilla trekking in Odzala-kokoua National Park which is the large national park to the north of the country of Congo Brazzaville in west-central Africa which the nearest country being Democratic republic of congo, When booking a congo safari , learn that congo gorilla safaris will offer you gorilla trekking adventure to all the 3 Gorilla trekking species of Eastern Lowland gorillas , Mountain Gorillas, Western Lowland gorillas. 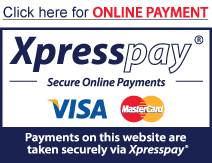 Odzala-Kokoua National Park Highlights . Odzala-Kokoua National Park popularly known as Odzala National Park Congo is a national park in the Republic of the Congo which was established in 1935 as protected Areas for the conservation of the Western Lowland gorillas and other forest Animals. Odzala-Kokoua national park is an approximately 13,500-square-kilometre national park and biosphere reserve in northwestern Republic of the Congo. Odzala-Kokoua has approximately 100 mammals species, and one of the continent's most diverse primate populations. Odzala-Kokoua national park has dry forest, savanna, and rain forest ecosystems, Odzala-Kokoua was once home to nearly 20,000 gorillas but the poaching has lead to a reduction in number. Congo Safari tour tailored by Congo Gorilla Safaris include viewing the most lovely Western lowland gorillas in their wilderness while trekking the gorillas after Bonobos trekking in the wilderness of Congo with other primates & wildlife like bongo, buffalo, African elephant, forest hog, giant forest hog, western Lowland gorilla, and sitatunga, Mammal species include the African civet, African forest elephant, black-and-white colobus, and common chimpanzee. Approximately 440 bird species have been recorded in odzala national park and the bird Species include the African fish eagle, black-backed cisticola, black-throated palish, black-winged pratincole, eastern wattled cuckooshrike, forest robin, forest wood hoopoe, great snipe, green pigeon, grey parrot, grey-headed broad bill, lesser kestrel, Pel's fishing owl, pied kingfisher, red-capped crombec, red-throated cliff swallow, Uganda woodland warbler, and yellow-capped weaver. Herons, horn bills, and kingfishers are also present, including the goliath heron, black dwarf horn bill, and giant kingfisher. When your interest is to go birding , then the best option is the select Congo gorilla Safaris to tailor for you a great congo Birding Safari tour to Odzala National Park. 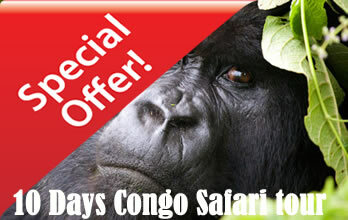 Detailed 9 Days Congo gorilla Tour - Western Lowland Gorilla Trekking. 9 Days Congo Gorilla Safari takes you to odzala national park in congo when staying in all the three comfortable camps of Ngaga camp, Lango camp, and Mboko camp within National Park . Each camp's location will reveal diverse landscapes that sustain a variety of wildlife and offer a unique glimpse into this seldom-traveled region of Africa. This Congo trip starts from Brazzaville the camp city of the Republic of congo and ends at the airport. Explore through unique forested and riverine habitat in search of western lowland gorillas, bird life, and surprising denizens coexisting in the world’s second-largest expanse of tropical rain forest. Upon arrival at the airport , you will be assisted at Maya Maya and go through the local clearance as you check in into the domestic Flight to Mboko Camp. Odzala Charter shared flight to Mboko leaves at 1:00pm and takes 2 hours to arrive at Airstrip, the road transfer from the airstrip to the Ngaga Camp takes 2& 1/2 hours drive to arrive at the most lovely National park camp in the wilderness of Odzala National Park . Dinner and overnight at Ngaga Camp. Like the Case its for the mountain Gorilla trekking & Eastern lowland gorillas , still you will head to the park headquarters for briefying about the gorilla trekking rules and regulation as they will take you through the conservation measures for the conservation of the Western lowland gorillas in the wilderness of Odzala National park. Once the Gorillas are found , you will stay with the gorillas for one hour as your watching them play, feed them and after you will return to the lodge for relaxation as you enjoy your lunch , in the evening hours you will go for nature walk in the jungle forests of odzala national park where you may spot the other wildlife animals likes forest elephants, Monkeys and various Bird species, Dinner and overnight as above. On this day you will enjoy morning breakfast at the camp and head straight to start the search for the western lowland gorillas . Congo Gorilla trek in the morning will take you around 2-4 hours and later you return to the camp for lunch , where by in the evening hours , you will explore the gorilla research team, forest walk and a night walk to view nocturnal forest life, Later return to the lodge for dinner and overnight as Above . its the best option as recommended by Congo gorilla safaris that travelers planning to go gorilla trekking in the wilderness of Congo should explore the Western lowland gorillas on the double gorilla tour with the experienced ranger guides from the Odzala National Park offices. On this lovely Day , you will wake up in the sun raise day and enjoy a relaxation morning as you prepare to transfer from Ngaga Camp to Mboko Camp in the famous largest national park in congo of Odzala in your 4x4 Safari Jeep. During the transfer you will drive through the Mbomo village and arrive at Mboko Camp for lunch followed by late afternoon river cruise and an African beer sun downers. Dinner and overnight Mboko Camp. After morning breakfast, you will head for boat cruise on a peaceful paddle down the Lekoli River was rudely interrupted by a string of sandbanks, forcing us into the water to free the boats, all the time aware that we were not alone as there is always the forest elephants and other wildlife animals. After return to the lodge for lunch and in the evening go for the birding adventure in the jungle of Odzala ,During the Nature walk , you will visit the Bai , where you will Spot wildlife from the Camp like the Forest Buffalo and Harnessed Bush buck. Dinner and overnight at Mboko Camp. Please Note : Ensure that you have suitable footwear for river wading. Closed light-weight and fast-drying walking shoes with socks do the job. Day 7: Bird watching in Odzala National Park. After morning breakfast at the wilderness of Lango camp, you will go for a bird watching tour in the jungle , you will spot various Birds like African grey parrots in the bai or Guided adventure walk for memorable jungle experience . Dinner and overnight at Lango Camp. Day 8: Transfer to Brazzaville City for sight seeing of the city. Early breakfast at Lango Camp and go for Game drive in the wilderness of the Odzala for wildlife spotting alongside the animals in the forest, later transfer to transfer followed by raised wooden path walk through swamp to Mboko Camp. Odzala Charter Flight: departs Mboko airstrip at approximately 9am, arrives Brazzaville at 11am, where you will go for the city tour. Brazzaville, capital of the Republic of the Congo, is the country’s largest city and launching point for our short excursions north of the Congo River. Ideal travel experiences for individuals and groups who are short on time. After morning breakfast, you will be waiting from hotel, you will transfer to the airport for the international flight back home . Connect with onward flight. End of the 9 Days Congo gorilla safari- Gorilla trekking Odzala National Park. Note that a valid yellow fever certificate is an entry requirement for the Republic of Congo. A health official checks before you arrive at the Visa Desk. Brazzaville is safe. Local taxis and guides are available and helpful in pointing out good local restaurants and local sight-seeing activities. It's well worth setting aside 2 full days to explore the city. Plan an ultimate congo gorilla safari tour to enjoy gorilla trekking in Virunga on mountain gorillas in Congo. Plan and enjoy congo gorilla trekking tour on 3 days congo Safari to go watching the Eastern lowland gorillas in Kahuzi Biega. 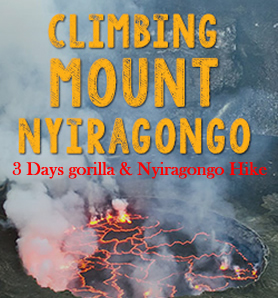 3 Days Climbing Nyiragongo From $$ 1000. Go for Easter lowland gorilla watching & Habituation experience in Kahuzi Biega National Park to explore the critically endangered species only found in DR Congo ( Eastern Lowland Gorillas). Explore Destination. Go gorilla trekking in Africa’s oldest national park of Virunga known to be the home for the mountain gorillas & other primates. Explore Destination. Wildlife safari destinations in Congo , plan to include Upemba national park for wildlife viewing on Congo Safari tour. Explore Destination. Explore the largest forest national park in Congo that is bigger than Belgium . Visit Salonga National Park to view the primates & Forest Elephants. Explore Destination. Explore kundelungu national park specially for wildlife viewing the wilderness of congo while on a congo Safari tour .Explore Destination.